In 2016, the MRWA and project partners, Trout Unlimited, US Forest Service, the Newaygo Road Commission and the Muskegon Conservation District, received a National Fish and Wildlife Foundation grant to begin a whole-system approach to restoring aquatic organism passage and stream function within the Bigelow Creek Watershed. The same grant also included funding for a major reforestation effort focused on riparian acreage within the Muskegon River watershed. Both elements of the project represent high impact improvements to overall water quality. A prior study revealed that the Bigelow Creek watershed had nine road-stream crossings that were undersized, perched, and misaligned. This had led to blockages in fish passage, reduced aquatic connectivity and excessive run-off of nutrients and sediment. The storm water, which rapidly entered the river at the crossings tends to raise the water temperature due to lack of time for the water to soak into the ground to cool. To address the multiple problems associated with the crossings the project partners met prior to the grant award and developed a multi-phased approach to restore complete connectivity in the watershed. During this time, we evaluated all road-stream crossings, prioritized locations and strategically planned replacement projects to produce near shovel-ready projects. We designed the road/stream crossing replacements with guidance from the USDA Forest Service “Stream Simulation Method: Designing for Aquatic Organism Passage at Road Stream Crossings”. This design technique aimed to mimic natural channel conditions through the crossings by using intra-system references (i.e., natural channel width and slope) as a template. In all we replaced three of the highest priority crossings. Although the original grant called for two we were able to leverage additional funds to complete a third. The characteristics of the natural stream channel which was installed at each crossing was informed by the channel dimensions immediately upstream and downstream of the crossing. 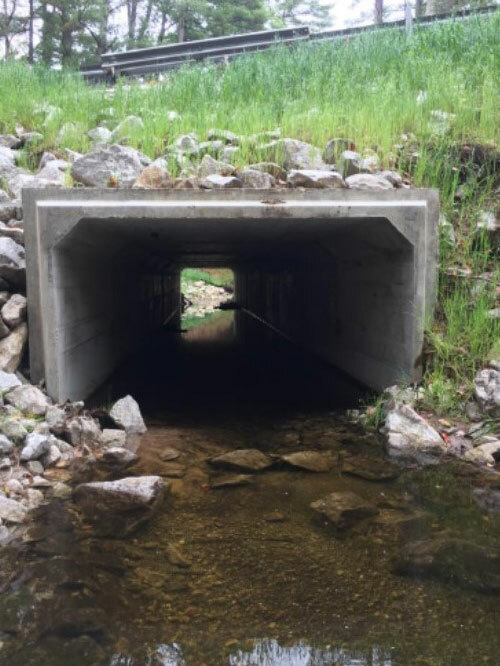 The replacement concrete box culverts which were placed in the channel both exceeded stream bankfull width (1-2yr RI) and the stream slope was matched throughout the culvert length. A natural stream channel bottom was created using specified sediment gradation based on natural channel references and analogs. The project team conducted ground surveys to collect all data and information to assist with the design of the improved road/stream crossings. The first crossing was located at 40th Avenue on the east branch of Bigelow Creek. 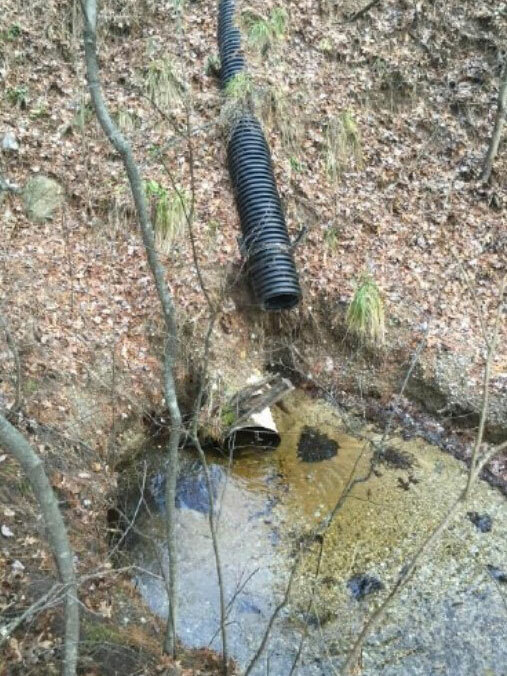 This site was the most severely impaired crossing in the watershed with a single, small PVC pipe (photo enclosed) connecting the upstream and downstream sections of the creek and a flex pipe, directing run-off directly into the middle of the river channel. We replaced all of this in 2017 with a large box culvert. Because both original culverts were undersized relative to natural stream-channel width high flow velocities in the culverts resulted prohibiting upstream fish and aquatic organism movement. Small-bodied fish suffered the most severe impact, which likely affected their recruitment to older age classes, a limiting factor to a fish community as a whole. The east branch crossing had the greatest amount of annual sediment introduction to the Bigelow Creek watershed, as estimated by the Michigan Road Stream Crossing Inventory as 4.82 tons/yr. The crossing over Bigelow Creek had an estimated sediment delivery of 3.48 tons/yr. Both crossings were at risk of wash-out that would result in negative impacts to the environment and high maintenance costs. 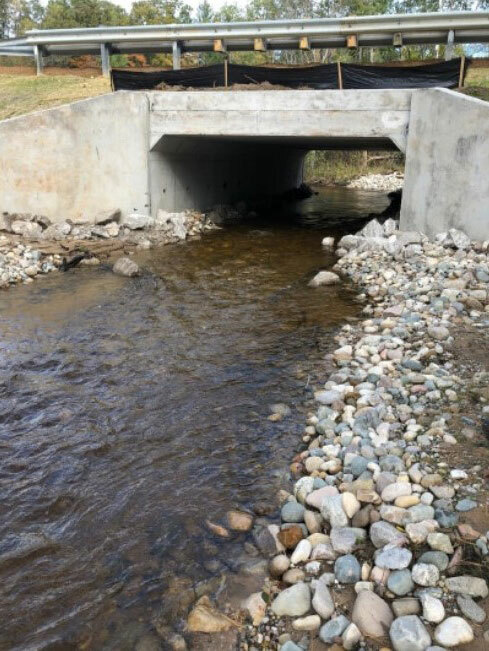 Contractors improved road approaches to the culverts and added paving that directed storm water away from the creeks and into a floodplain area. The additional road-stream crossing, which was identified for the 2nd phase, Spruce Avenue and East Branch Bigelow, was also completed in 2018. The three improved crossings were all within a 57 acre area and within .75 miles from each other. The goals of the reforestation component of this project included protecting, restoring and enhancing habitat for cold-water aquatic species, increasing wetland habitat values that benefit aquatic species, and improving local recreational and economic values. An additional goal included the collaboration of state and federal agencies along with NGO’s to restore aquatic ecosystems in watersheds across the Huron-Manistee National Forest. To accomplish these goals the Muskegon Conservation District recruited seven private landowners for riparian reforestation and secured long-term maintenance contracts to ensure trees were cared for and maintained. Conservation District staff instructed landowners on the importance of trees in maintaining cool stream temperatures and reducing storm water runoff into rivers and tributaries. Most of the sites were adjacent to tributaries of the Muskegon River while one property was immediately on the main stem of the Muskegon River where almost ¼ mile of tree planting occurred. The acreage of native tree planting in the agreement was exceeded by almost 100 acres because of willing landowners and additional funding which became available. As part of an eight-year investigation to evaluate the Muskegon River Watershed, researchers developed a multi-model risk assessment tool called the Muskegon River Ecological Modeling System (MREMS). The tool identified several problem areas which were negatively influenced by land use changes (urbanization / development), erosion and sedimentation, effects of dams on the river system, as well as climate change. The MREMS provided recommendations to protect the ecological integrity of the Muskegon River Watershed and included the identification of High Priority Riparian Areas in the Muskegon River Watershed and recommendations for the most effective ways to ensure long-term hydrologic stability. One primary recommendation was securing permanent conservation of riparian lands as well as reforestation and installation of vegetative BMPs along riparian corridors in high priority sub-basins. For this particular project, Cedar and Bigelow Creek, two of the priority watersheds of the Muskegon River were targeted for riparian reforestation. 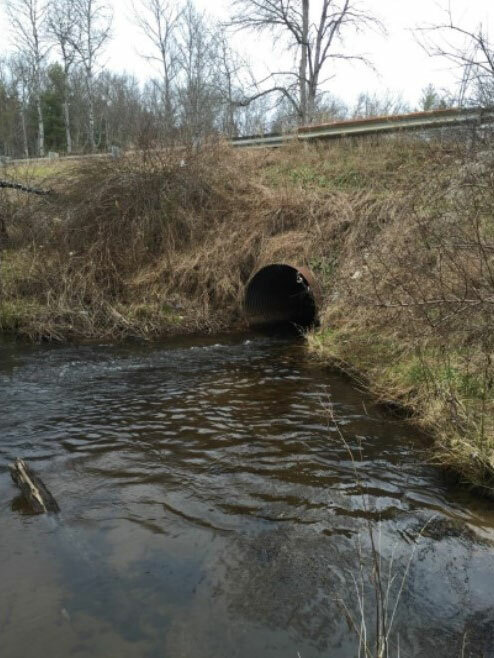 In summary 3 road-stream crossings were replaced, reconnecting over seven miles of high-quality cold-water habitat and reducing sediment loading by an estimated 8.3 tons/year. For the first time, upstream movement of Salmonids was observed in 2018.